Terroir: Coste di Rose is a prestigious hill with full eastern exposure located in the community of Barolo, just in front of the Bussia area of Monforte. Coste di Rose is characterized by a more then 40% slope, which allows perfect cluster maturation, which is extremely demanding in terms of light and heat. The hill is of the Helvetian geological age, but, curiously, the soil quality is moderately calcareous (this originated from the marine deposits uplift, which are still found through regular agricultural maintenance) and especially rich in quartzite sand, fine limestone and just a small amount of clay. These peculiar characteristics impart to the Nebbiolo vines an intense and fine aroma, that bring to mind hint of wild mint. Vinification: The harvest takes usually place during the first ten days of October: grapes are collected exclusively by hand, quickly brought to the cellar for destalking and soft pressing. The grapes undergo fermentation at a controlled temperature of 82-86°F in stainless steel tanks. Maceration of the skins with pump-overs lasts 10 days. The wine is racked into concrete tanks temperature for an extended period. In this way, malolactic fermentation starts spontaneously. The wine is initially aged for two years, a part in 30-36 hl Slavonian oak barrels, and the rest in 225 L French oak barrels that are moderately toasted. The two parts are then blended in the traditional big oak barrels and the wine ends its fining in the bottle before release. Ruby-red color tending to garnet. Intense perfume with clean scents of roses, licorice, spices and aromatic herbs. Full, elegant, and full-bodied flavor with recurring hints of the olfactory sensations. The soft color and the structure confirm it as an immediately pleasant, balanced and harmonious Barolo. 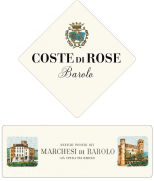 The Barolo Coste di Rose reaches its maturity after 4 years from the harvest and matures further between 4 and 20 years. An outstanding red wine for roasts, this Barolo combines exceptionally well with main courses of red meats, braised dishes and aged and piquant cheeses. When aged at length, it makes a superb sipping wine.